Nairobi’s Community Hill still puzzles me. It was from that very spot that the pioneer Nairobi administrator, John Ainsworth was taken by the powerful railway engineer, George Whitehouse in 1900 or thereabouts, to be shown some land – far from the railway line – where he could build structures for the Imperial British East Africa (IBEA) administrators who were to leave Machakos for Nairobi. Here, he decided to put a camp for his police – and it is a scandal that these same structures were still occupied by administration police until this year when they burnt to the ground. It is again on this hill, secure because of the topography, which Ainsworth built these very structures and on the opposite hill, on the grounds of National Museums, he built his residential house – which was demolished to give way to the Coryndon Museum, the modern day National Museums. From these two hills his security would watch over Nairobi from a vantage point. But only fate had moved them there because the railway had taken the best lands in Ngara and was given priority over the government. Thus, the government was pushed to the edge of the Kikuyu escarpment. From this buildings, now gone, lay the frustrations that IBEA officials went through in their efforts to make Nairobi a township. They were the first efforts to have government buildings concentrate around Community Hill – and the reason why that area still houses some many of government ministries to date. It is in this area that in May 18, 1906 that Sir James Sadler, the Commissioner for the East African Protectorate suggested to Winston Churchill, then Secretary of State, that the future capital of Kenya should be built away from the plains. Sandler argued that the site selected by Uganda Railway managers had inadequate drainage, and was unsuitable for a large and growing population. Nobody listened. The government quarters continued to expand around Community Hill moving West to the wooded areas as business congregated near the railway line. That story is now halfway buried in the ashes of the burnt down police lines. A chapter of Nairobi history is gone. It had been recommended that the town be removed “to some point on the hills”. 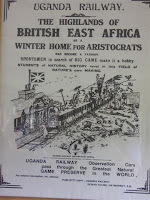 But the railway engineers were not seeing Nairobi emerge to anything more than an Indian township which they argued could “prosper inspite of insanitary conditions and chronic plague.” Without anyone noticing corrugated iron shops began to mushroom on the plains as Indian coolies, whose contracts had expired, started turning to business. Prostitutes, sightseers started crowding the new railway depot- some looking for fun, others for leisure. With amazing speed the railway depot started looking like a town. They called it Tinville! Those who hated it more called it City under the Sun due the scotching heat with no cover. Ainsworth is one of the most interesting, one of the most complex, AND one of the most respectable and impressive characters in Kenyan history. What inscribed him into my heart, was his position as probably Kenya's first outspoken feminist, at a time when European women had oly barely gained suffrage - and that on behalf of black Kenyan women, not of settlers' wives. The Ainsworth House still stands, preserved, within the grounds of Nairobi National Museum.